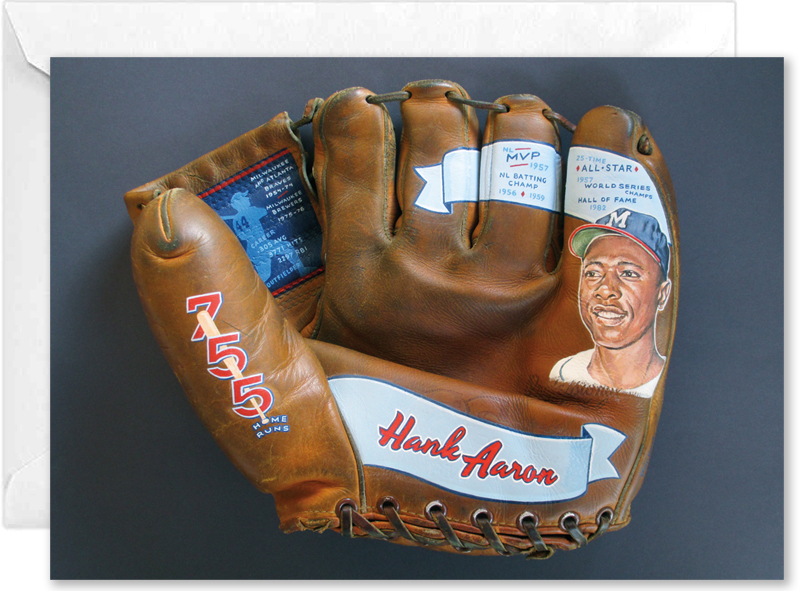 Hall of Fame catcher's career is celebrated on this vintage baseball glove by artist Sean Kane. Shipping is Free. Purchaser pays No sales tax for deliveries to the U.S. Click for secure credit card payment via PayPal. 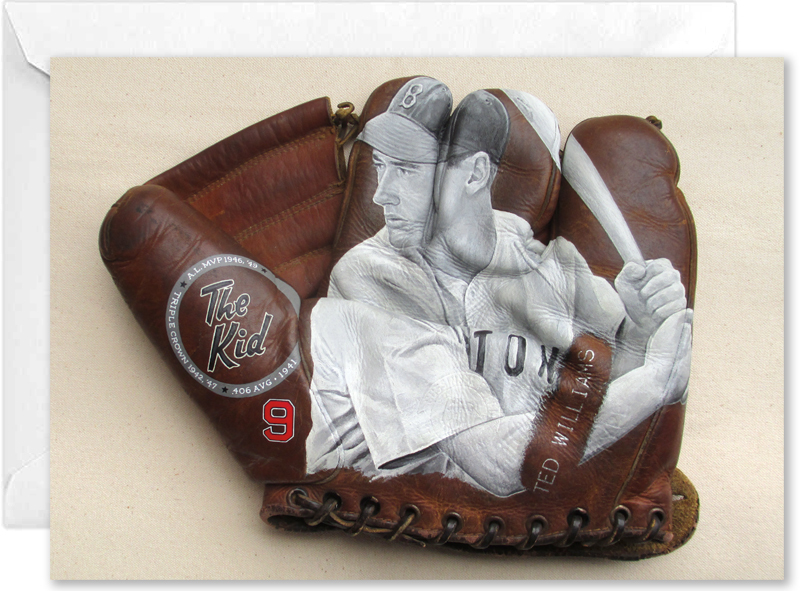 Please allow 5-7 business days for this painted glove art to arrive. Need it quicker? Just let me know. Berra is celebrated with this hand-painted depiction on a mitt from the era in which he helped the Bronx Bombers win ten World Series championships. Berra's three MVP seasons and 15 straight All-Star appearances are noted, as is his Hall of Fame induction in 1972. Berra's career stats are included next to his retired number 8. 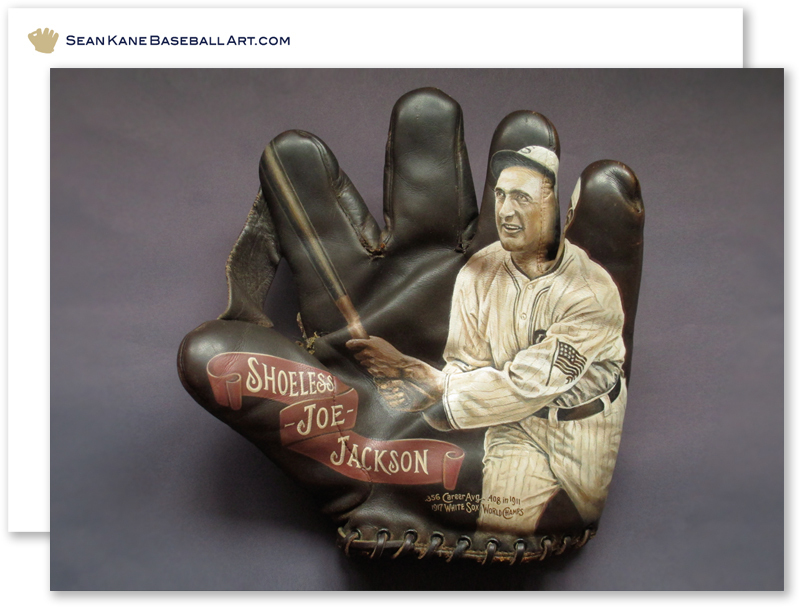 The Spalding catcher's mitt has a stamped Larry "Yogi" Berra signature below a stamped illustration of a catcher. 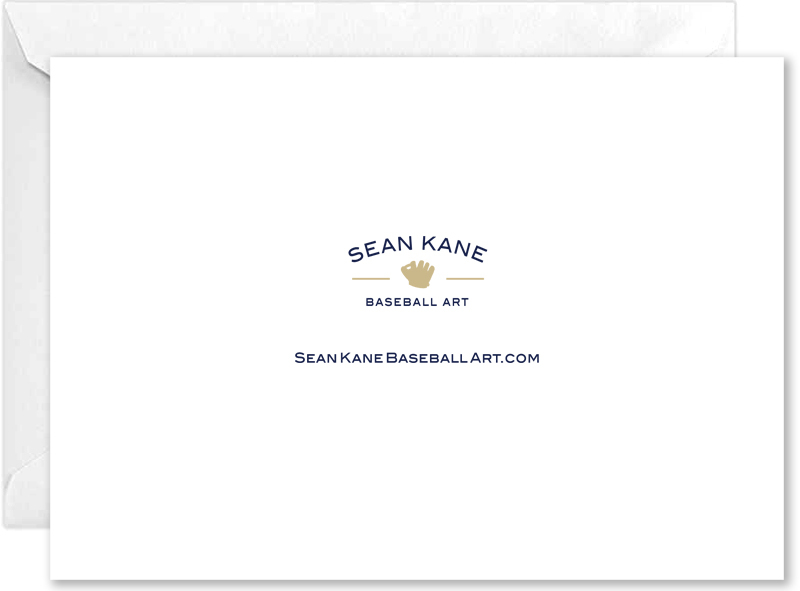 This baseball keepsake is sure to be a conversation-starter. 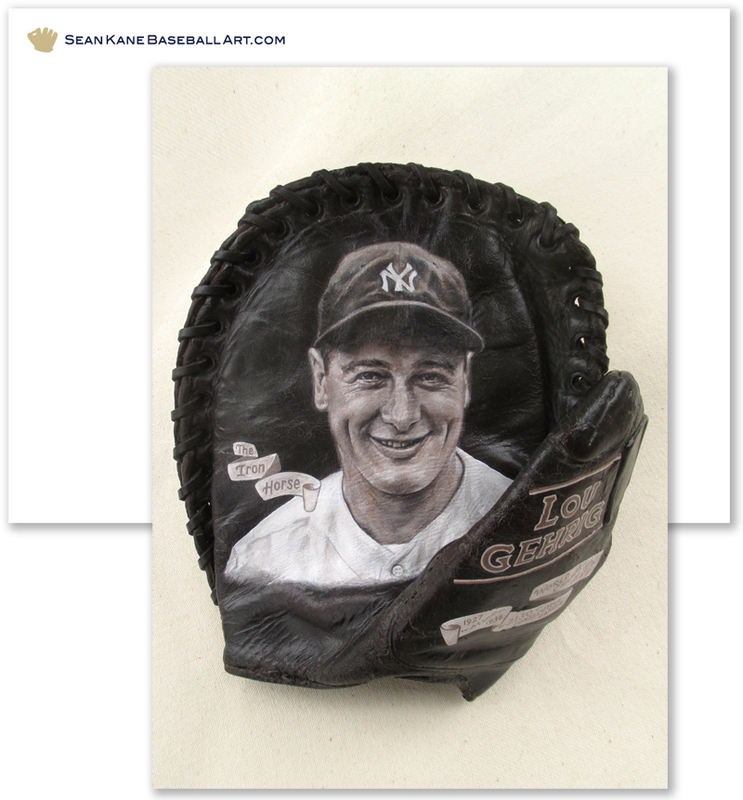 This baseball glove art of Yogi Berra painted by Sean Kane is available for $3500. Click Purchase button to be taken to secure checkout via PayPal. You will have an opportunity to leave delivery notes at checkout and will receive a prompt receipt with confirmation of purchase and shipping details. Questions and inquiries are welcomed. Contact via Email or by phone at 519-836.5647 to make purchase and shipping arrangements. On October 8, 1956, in Game 5 of the World Series at Yankee Stadium, Don Larsen threw a Perfect Game against the Brooklyn Dodgers, winning 2-0. At the time, it was the first Perfect Game thrown in 34 years. It has been immortalized by the famous image of Yogi Berra jumping into Larsen's arms in celebration after the game. 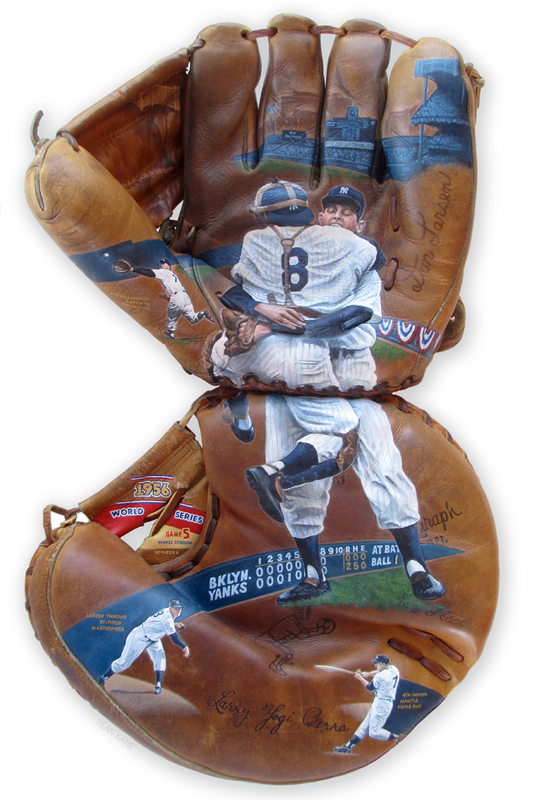 I've created my own take on the significant event using two gloves, Don Larsen and Yogi Berra signature models. The artwork features details of Mickey Mantle's home run and outfield catch, Yankee Stadium, the scoreboard as it appeared for the last pitch and Larsen throwing the first pitch. This painting is in the collection of The National Pastime Museum and was unveiled on October 7, 2016, on the eve of the 60th Anniversary of the Perfect Game. More details and images to come. 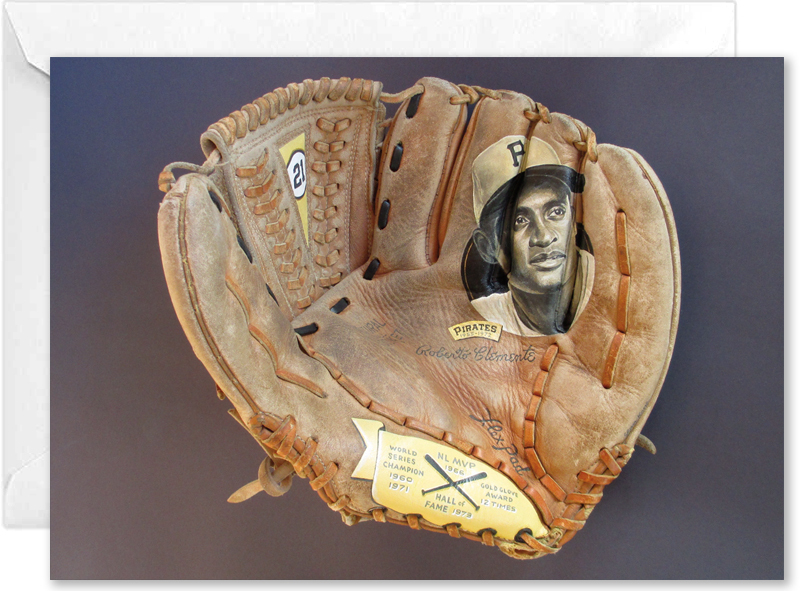 This Glove art is sold. 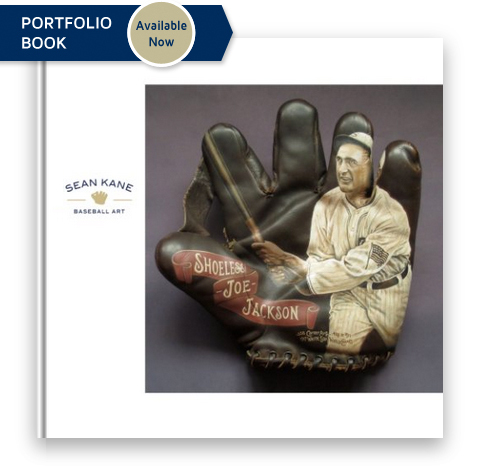 It's among nearly two-dozen painted gloves created over the years that have been collected into this portfolio book, "Sean Kane Baseball Art", Available HERE. 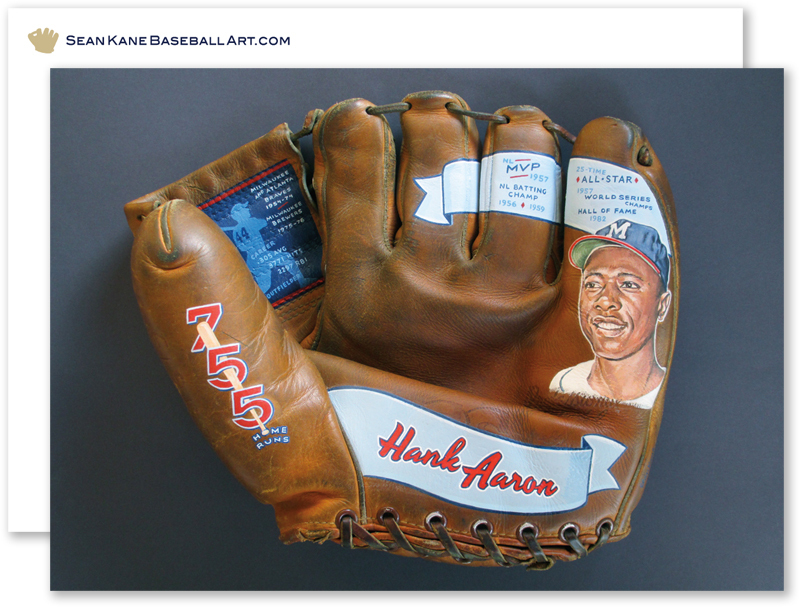 Painted glove artwork by Sean Kane is in the collection of museums, private collections and has been commissioned by the Philadelphia Phillies and Milwaukee Brewers Fantasy Camp. 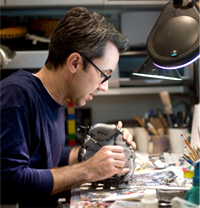 His work has been recognized by the National Art Museum of Sport and featured on ESPN.com and MLB Network Radio. This classic catcher's glove features a hand-painted portrait of Hall of Famer Yogi Berra. The baseball icon is depicted in his younger years with his All-Star, MVP and World Series Champion years carefully hand-lettered. Lawrence Peter "Yogi" Berra played on a record 10 World Series Championship "Bronx Bombers" teams between 1947 and 1962. He was an All-Star each year from 1948 to 1962. And Yogi was AL MVP in 1951, 1954 and 1955. Besides catcher, Yogi played outfield and was a manager of the New York Yankees and New York Mets. Yogi was elected to the Baseball Hall of Fame in 1972. 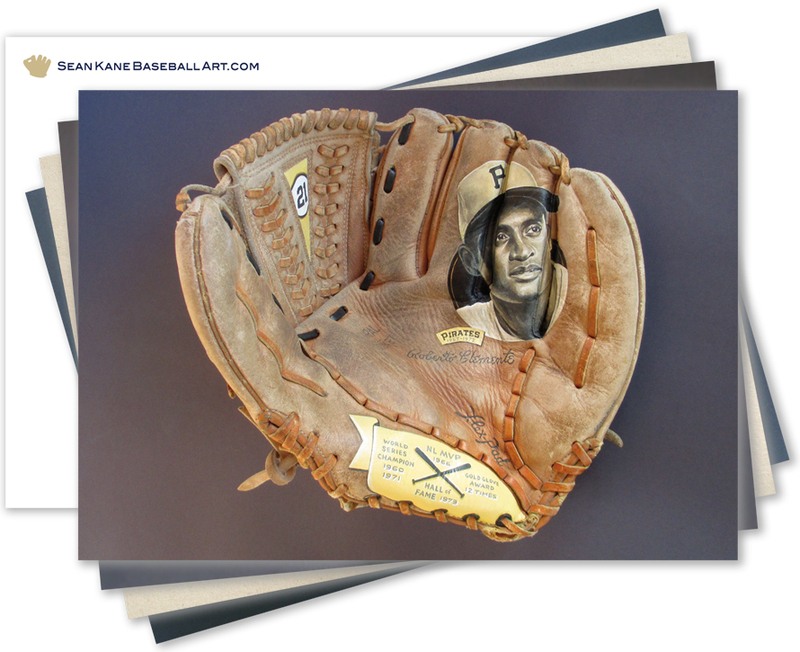 The catchers glove is painted with archival-quality acrylic paints and sealed with a protective varnish. 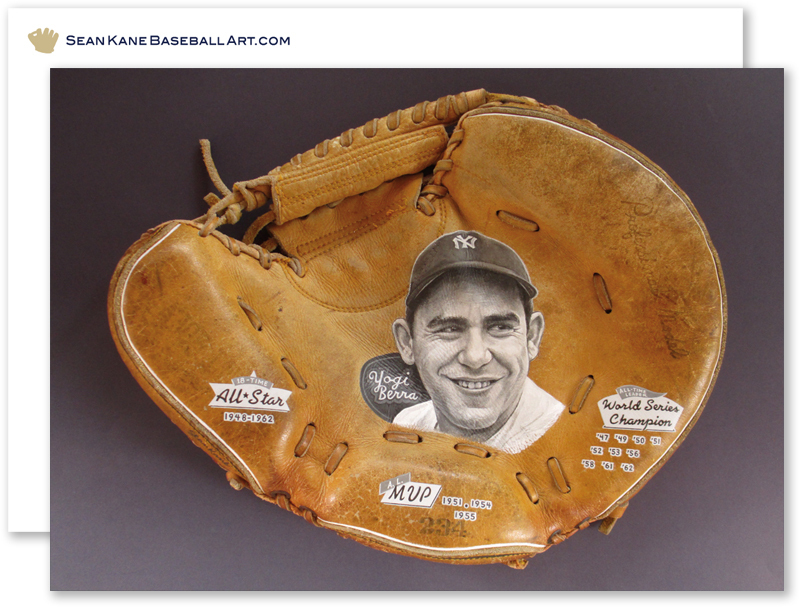 Fitting for a man known for his famous quotes, this Yogi Berra glove art is sure to be a conversation starter for the baseball fan displaying it in their home or office. This one-of-a-kind Yogi Berra painted catcher's glove art has been sold. 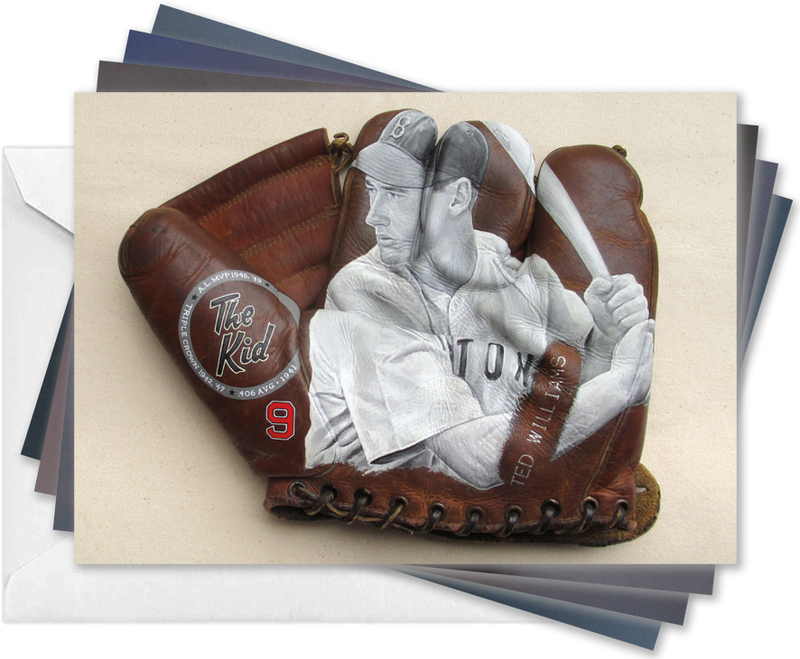 Questions and inquiries about an entirely new, unique Yogi Berra glove painting are welcomed. Contact via email or by phone at 519-836-5647.